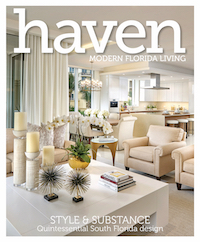 Visit the Kips Bay Decorator Show House Palm Beach through February 20. 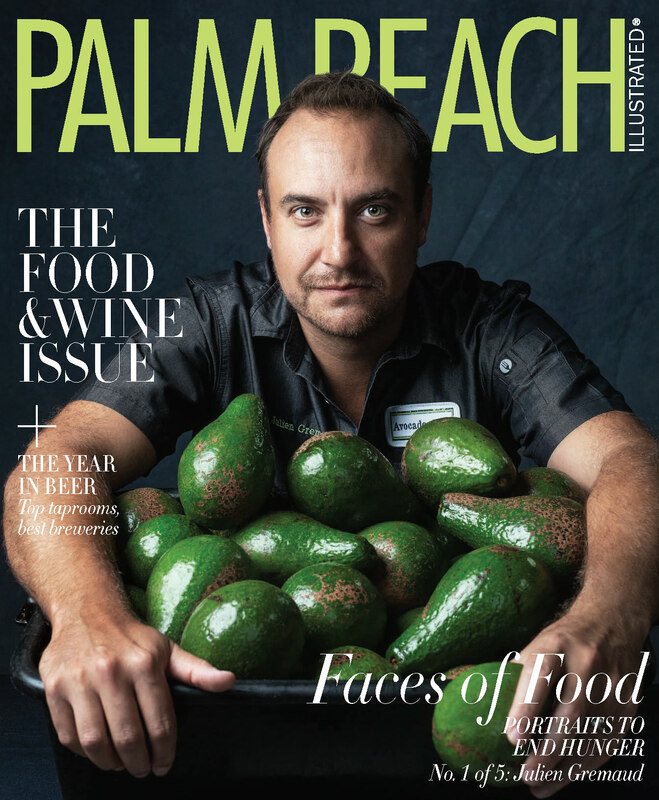 The Kips Bay Decorator Show House Palm Beach has returned to West Palm Beach. Now in its second year, this creative philanthropic project unites 22 of the country’s best interior designers to reimagine a grand home, all to benefit the Kips Bay Boys & Girls Club and Boys & Girls Clubs of Palm Beach County. For 2019, the designers were given free rein to redecorate a 10,000-square-foot Mediterranean-style mansion at 6215 South Flagler Drive. The results are now on display through February 20, from 11 a.m. to 5 p.m. Monday through Saturday, and from 12 to 5 p.m. on Sundays. Tickets to tour the home cost $35. On certain days, your ticket also grants you access to special events ranging from musical performances to chef demonstrations. Here are some highlights: discussion with Sam Sifton, New York Times food editor, January 30, 12 p.m.; Alexander W. Dreyfoos School of the Arts performance, February 2, 11 a.m.; floral demonstration with Cathy B. Graham, February 9, 11 a.m.; cooking demonstration with chef Edison Ramirez and Celis Produce, February 13, 12 p.m.; cocktail presentation with Bryan Long of the Eau Palm Beach Resort & Spa, February 20, 12 p.m. Regardless of when you visit, you’ll be able to explore ample design inspiration across two floors. Throughout the space, designers incorporated sponsor products, including window treatments from The Shade Store and sinks from Kohler, but each brought his or her distinct point of view. Below, we share some standouts from our tour of the 2019 Kips Bay Decorator Show House Palm Beach. Visitors to the show house will enter unto a stunning amalgam of Floridian and worldly elements. 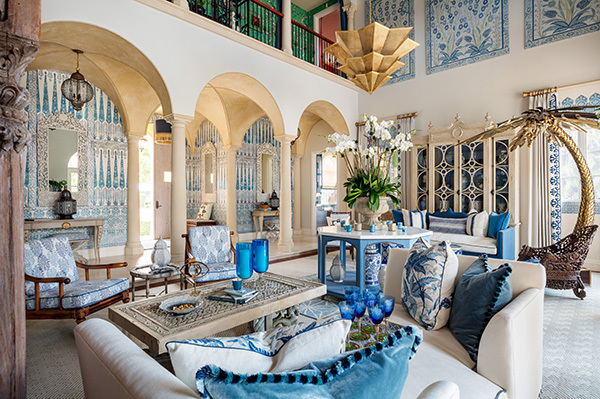 This exotic retreat features an array of Moroccan-influenced pieces, as well as a blue-and-white palette that recalls the sea and sky. The large palm tree acts as a lighting fixture, merging its whimsical aesthetic with a practical purpose. This magical chinoiserie garden for the home is a thrill for the senses. A custom pagoda bird cage houses five birds named for famous designers. Living moss outfits the circular staircase, acting as the “grass” to the blue “sky” of the carpeted steps, wallpaper, and tented ceiling. A sparkling spider nods to the fauna amidst all this flora. This “sunrise jungle” comes alive with shades of ocher and terracotta. 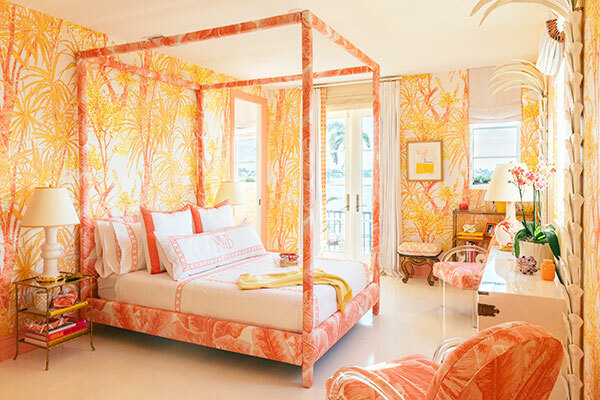 The designer covered the walls with her Rainforest wallpaper and created custom vintage-inspired furniture items, such as lucite chairs upholstered in a pink leaf print. A peach-toned bath acts as a visual relief from this vibrant display. Located just off of the outdoor pool, this indoor cabana encapsulates all things Palm Beach. An interplay of purples and pinks appears throughout the space, from a shell accent wall to the adorable round changing structure outfitted in bold fabrics. A few artistic odes to Marilyn Monroe complete the room’s playful panache. There is so much more loveliness to explore! Click here to learn more.